Our Total Balance and Omega 3/DHA products help you to maintain a healthy heart and cardiovascular system...as well as all your other systems, but some customers also need a supplement that specifically supports the circulatory system such as Cardio-Support. Our chief researchers got to work on the problem and after more than a year of research Cardio-Support was developed. This was further refined in our second generation of this product. In the second generation of Cardio-Support we added a high potency special enzyme called Nattozimes® to help maintain arterial health and function. It also helps support healthy blood flow and the natural clotting management properties of blood. However, a problem with Nattozimes®, as with all enzymes is that they are very sensitive to stomach acid. For maximum efficacy Nattozimes® have to be protected as they pass through the stomach. A natural supplement, not a drug! Cardio-Support is a natural supplement that utilizes a special enteric-coating system to safely protect the active ingredients from stomach acids and release them in the upper intestine. This delivery method not only protects the enzymes such as Nattozimes® but also greatly enhances the efficacy of other ingredients present such as Trans-resveratrol and Reduced L-Glutathione. Also, for those customers who are on statin drugs...we wanted this formula to help support the body’s ability to cope with the effects caused by Coenzyme Q10 depletion from medication. This is why we included it in the formula to help offset this depletion. And...most importantly these nutrients have to be combined in a synergistic way to work together! This has all been achieved with Cardio-Support. Have a look at the ingredient tab to get a better appreciation of what has gone into this product to support cardiovascular health. Cardio-Support can also be taken in combination with our Core Wellness Activators, including the Total Balance complete nutrient system and Omega 3/DHA Fish Oil products. Cardio-Support contains 49 bioavailable actives, all of which play a specific role in helping maintain a healthy heart and cardiovascular system. The individual ingredients are thoroughly researched before inclusion and only the most effective form of each is used. Because we use specialized enzymes such as Reduced L-glutathione, we ‘seal’ in the goodness of all the nutrients by enteric coating the tablet which enables them to be released only in the upper intestine instead of the stomach where they would be converted to less potent forms. Other Ingredients: Microcrystalline Cellulose, Enteric Coating (Purified Water, Ethylcellulose, Ammonium Hydroxide, Medium Chain Triglycerides, Oleic Acid, Sodium Carboxymethyl Cellulose, Talc, Polydextrose), Dextrose, Maltodextrin, Tripotassium Citrate, Silicon Dioxide, Sodium Carboxymethyl Cellulose. Daily Serving: Adult optimum dose - 3 tablets 2 times daily (6 tablets per day) / Adult maintenance dose - 2 tablets twice daily (4 tablets per day). Combines well with our Omega 3 Fish Oil products, Total Balance, and Lipi-Rite. 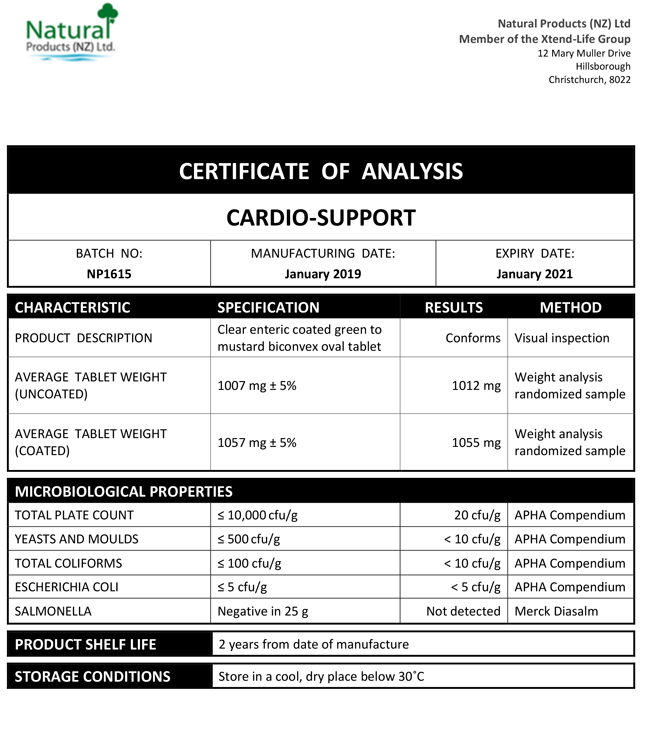 We have included below a copy of a typical Certificate of Analysis (CoA) for our Cardio-Support product. You will note that there are two columns which are headed 'Specification' and 'Results' respectively. The specifications are simply our minimum standard to which each batch of Xtend-Life Cardio-Support has to conform, otherwise we would not release it. The results are the actual results from the independent laboratory that did the testing. What are the main benefits of Cardio-Support? Cardio-Support contains ingredients that support different aspects of cardiovascular and heart health, including arterial integrity, blood health, heart muscle strength and blood flow. More specifically it may help to maintain healthy levels of aggregation of platelets and calcium levels. This product is a synergistic blend of high-quality ingredients and may be used to protect future cardiac health, care for current heart health and is especially recommended for those that are on statin medication, as it helps to replenish CoQ10 lost as a result of these drugs. How long will it take to note a difference from using Cardio-Support? For best results we suggest that you follow our 'recommended protocol' suggestions. Cardio-Support is recommended at 4 tablets per day (2 x 2). It is recommended that Cardio-Support is taken in conjunction with a healthy dietary and exercise regime for cardiovascular health. As this is a naturally based product it will work differently for every person and the time taken to see results will vary. We recommend using this product for a minimum of three months before visiting your doctor for a check-up to assess if there has been any change to the status of your cardiovascular health. Do I need to take Lipi-Rite AND Cardio-Support, as they both help maintain healthy cholesterol levels? Lipi-Rite and Cardio-Support work in different ways. If you want to specifically concentrate on maintaining balanced and healthy cholesterol, then our Lipi-Rite formula is highly recommended. Cardio-Support certainly may be a valuable addition to this regime. If you are only moderately concerned about your cholesterol, then Cardio-Support may be adequate in helping to support healthy cholesterol levels. Does Cardio-Support help with general inflammation and detoxification? Cardio-Support contains a number of active ingredients which help support healthy inflammation management in the circulatory system which enables the body to function better and perform its normal everyday systemic functions including the removal of toxins from the body. Will Cardio-Support help address tingling or numb hands or feet? It is possible that Cardio-Support may help support healthy blood flow and circulation, including blood flow to the extremities. Therefore, it may well address tingling or numbness of the hands or feet that may be experienced by some people, especially the elderly who may not be as mobile. Will I benefit from taking Cardio-Support if I already take Total Balance and Omega 3/DHA fish oil? In order to see the best possible benefits for cardiovascular health we would certainly recommend using Cardio-Support at the same time as Total Balance and Omega 3/DHA fish oil. We have specifically designed our products to work in harmony with one another so there is only a minimal overlap in ingredients. To ensure the optimal absorption we recommend taking Cardio-Support two to three hours apart from Total Balance, or any other supplements or prescription medications. What ingredient in Cardio-Support helps with blood circulation? In effect all the ingredients in Cardio-Support can be said to help improve blood circulation; as they all assist in cleansing the arteries, meaning that blood flow is improved. Each ingredient is included for specific reasons and the unique properties that it may offer the cardiovascular system. Grape Seed Extract, Mahonia Terminalia, Green Tea Extract, MSM, Butchers Broom, Hawthorn and Zizyphus are a number of the key ingredients that may help to improve blood circulation. Can I use Cardio-Support to address my high blood pressure? Cardio-Support works in many ways. Firstly, it helps to cleanse the arteries of plaque deposits that may be one of the root causes of hypertension. It also helps to thin blood consistency, strengthen the blood vessel walls and the heart itself, all of which may help reduce high blood pressure. It works in a gradual way, to deliver long-term benefits, rather than on a short-term basis as many medications may do. If you have specific blood pressure problems, as well as Cardio-Support, we recommend using Omega 3/QH Ultra. In addition, dietary changes such as eating less high fat and salty foods, with a preference for fresh vegetables, fruit and whole grains is advisable. A regular exercise regime, including relaxation exercises if appropriate, is a good idea also. What is the recommended dosage for Cardio-Support? Servings per bottle: 20 (6 tablets per day) / 30 (4 tablets per day). Can I take Cardio-Support if I use prescription medications? Many chemical and synthetic drugs may interfere with natural ingredients and vice versa. It is always recommended to consult with your doctor prior to adding any supplement to a medication regimen. We recommend leaving a gap of 3-4 hours between taking Cardio-Support and any prescription medications. If you have questions about combining this with other dietary supplements, please contact us.